Over the years, organ transplantation has evolved into the treatment of choice for end-stage organ disease. However, the need for organs remains far greater than the supply. Each year, thousands of lives are tragically lost due to end-stage organ disease. Transplant medicine is unique in that it relies on a system of viable organ identification and family willingness to donate at what is an emotional and sensitive time. The remarkable progress of transplant medicine in the latter half of the twentieth century has led to an unprecedented demand for donated organs that have historically remained in short supply. As a result, relatively few organs are transplanted, compared to the number of people with end-stage disease. The shortage of transplantable organs in the United States was apparent as early as 1988 when we began keeping data on organ transplantion. 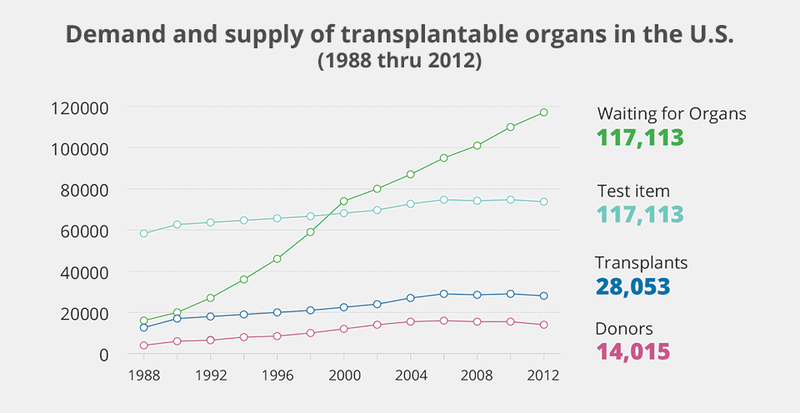 The graph above shows the widening gap between demand and supply of organs for transplant. In1988, there were 16,026 people waiting for an organ transplant but only 12,623 organs from 5,909 donors were transplanted, with a net shortage of at least 3,403 organs [1, 2]. In 2012, this increased to more than 116,000 patients on the waiting list for an organ transplant, but only about 28,000 transplants were performed from 14,000 donors . While the number of donors has been increasing at a steady rate, the number of people who are eligible for a transplant has, owing to transplant’s clinical success, far out-paced the supply. Although organ transplant is a clinically effective procedure, its health benefit to society is seriously limited by the shortage of donated organs and is therefore a public health concern. The Center for Organ Recovery and Education (CORE) is the OPO that serves this region. Founded in 1977, CORE is headquartered in Pittsburgh, PA with a regional office in Charleston, WV. Its region encompasses 155 hospitals serving 5.5 million people across 32 counties in Pennsylvania, 50 counties in West Virginia, and Chemung County in New York . CORE’s donation service area (DSA) covers 45,905 square miles and is the 22nd largest in the country . Each hospital in CORE’s DSA is a potential source of organ donors. In addition, five of these hospitals also have their own transplant programs. These hospitals are: Children’s Hospital of Pittsburgh, UPMC Presbyterian, Veterans Administration Medical Center, Allegheny General Hospital in Pittsburgh, and Charleston Area Medical Center in West Virginia. UPMC Presbyterian and Allegheny General also have the highest donation potential in CORE’s DSA due to the large number of patients at those hospitals. CORE’s dedicated in-house coordinators at these two hospitals are available 24 hours a day, seven days a week to make sure that no opportunity for donation is missed . While most organs are transplanted locally, organs recovered by CORE are transplanted regionally and nationally. Since CORE is deeply involved in working with critical care units in its partner hospitals, the OPO understands that it can be difficult to think about organ donation when a health care provider is focused on saving the lives of patients. To address this problem, the breakthrough collaborative in 2003 recommended that the critical care process should be tweaked to incorporate organ donation into routine care and identify it as a key responsibility of the critical care staff . The Institute of Medicine observed that the organ donation process and end-of-life care share a common framework of respect and compassion for patients and their families, and recommended that the organ donation process be an integral part of end-of-life care .